1. Mix together bengal gram flour, semolina, citric acid, sugar and green chilli paste. Add enough water to make a thick batter. 2. Add eno, sprinkle a little water over it and mix well. 3. Grease a thali and pour the mixture into it and steam for 10 minutes. 4. Heat oil. Add mustard seeds, sesame seeds, asafoetida and green chillies. 5. Add 90 ml of water to the tempering and pour the mixture on the dhoklas. 6. Cut into diamond shaped pieces and keep aside. 1. Heat oil. Add mustard seeds, asafoetida, red chillies, chilli powder, jaggery, tamarind paste and salt. 2.. Add 360ml of water to it and let it simmer for 5-10 minutes. 3. Place the dhoklas in a serving dish. 4. Just before serving, pour the rasa over the dhoklas. 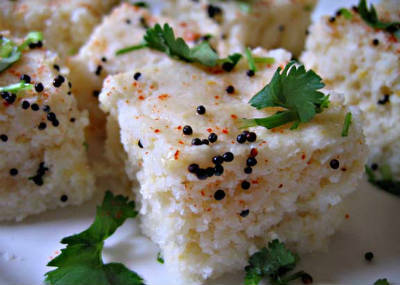 Feel free to comment or share your thoughts on this Rasawala Dhokla Recipe from Awesome Cuisine.